Congratulations! You’ve just finalized your backup and disaster recovery plan, ensured every step was tested and validated, and created SOPs so that when a disaster strikes, everything will be sorted without a hitch. Great work! You’re done, right? Ah, if only strategic initiatives were a one-and-done event; alas, disaster recovery is never a set and forget action item. On the contrary, setting up protocols for reviewing and updating your disaster recovery plan is essential to ensure business continuity should the worst occur. Every environment is unique, and the policies around and within your disaster recover strategy are no different. Internal and external factors – staff changes, site additions, or software releases – change the fabric of your response protocols, and your disaster recovery plan needs to change with them. Updating your disaster recovery plan does not have to encompass an entire restructuring of your process. In fact, by following the tips below, you can minimize the magnitude of plan updates and ensure business continuity. The best first step to updating your disaster recovery plan is to plan for it. Depending on the nature of your environment, you may need to perform a disaster recovery review every few weeks, once a quarter, or once a year. Aim to review more frequently than you expect and then adjust as needed. Workforce optimization tools make this easy. Many businesses find it beneficial to schedule disaster recovery reviews once a year – perhaps during a slower month – and review as needed throughout the rest of the year should environmental factors induce a change. However often your team chooses to review your disaster recovery plan, make sure they do it. Failing to update your disaster recovery plan is almost as bad as not having one. Changes within your organization are often the most likely to affect your disaster recovery plan. These factors may come from within your organization or outside it. As you prepare to review your disaster recovery plan as an organization, review change factors that may impact your current disaster recovery strategy. Backups are an essential part of a secure disaster recovery strategy. 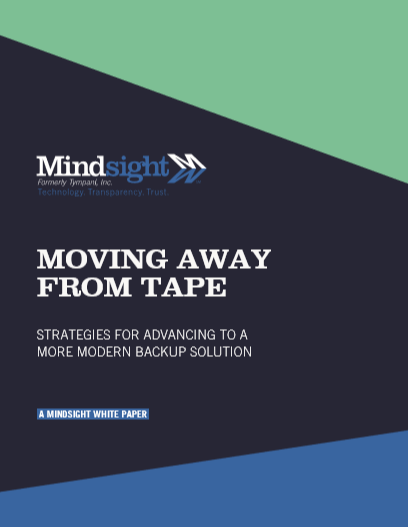 Find out more about modern backup solutions with our recent paper Moving Away From Tape:: Strategies For Advancing To A More Modern Backup Solution. Updating your disaster recovery plan can also be based on your organization’s experiences. The risks and threats your business faces change, and sometimes – no matter how much we prepare for them – those disasters strike. These calamities could be simply viewed as a failure; however, it is better to analyze these incidents and learn from them. Did your data center have a ventilation issue that led to overheating? Was network security compromised through poor BYOD policies? Whatever incidents occurred throughout the previous year should inform your disaster recovery review, providing insight into ways to improve your disaster recovery strategy. Every review should look at the ROI for disaster recovery plan implementation. The investment your business makes – through time, headcount, application, risk, and visibility – should inform your future plans. A possible outcome of a disaster recovery review is the realization that ensuring business continuity for your organization is something best left to experts. Investing in a partnership with disaster recovery experts also allows you to focus the IT team on more strategic initiatives within the department. Plus, a partner can take the lead on updating your disaster recovery plan in the future, so you can almost set and forget it. The work that goes into updating your disaster recovery plan is important, and ensuring all parties are privy to that plan is a vital last step. If the right people are ready to enact the plan in a disaster, the plan does no good. Ensure the plan is dispersed appropriately within your organization and all entities are aware of the plan framework. It goes without saying that storing your disaster recovery plan on a single server – where it could be compromised in the event of a disaster – is a bad idea. Ensure the plan is backed up and duplicated. Periodically reviewing your disaster recovery plan is an important step in ensuring it continues to accurately portray your environment and respond to the risks and remediation necessary for business continuity. Mindsight’s disaster recovery experts are here to help you create, review, update, validate, and manage your disaster recovery strategy. With managed data backup and disaster recovery, you secure your plan and your business. Business today demands continuous application availability with an infrastructure that can both recover from disasters and scale to accommodate dynamic growth. From power outages to the harsh hand of Mother Nature, it’s safe to assume your company’s resources are constantly at risk. IT is strongly tied to all business functions, so it’s extremely important to have a disaster recovery plan in place to protect your investments. Mindsight’s cloud and on-premise data backup and disaster recovery services help companies recover quickly and cost-effectively from any disruption. We do this by helping you create plans and strategies aligned with your business requirements. We thoroughly analyze your business processes and objectives to secure your business resiliency. Minimize your risk and protect your assets with Mindsight’s data backup planning and disaster recovery services.